The Olympic torch relay leading to the 2014 Winter Games in Sochi, Russia, chalked up a space first Saturday, with two cosmonauts staging a symbolic handoff, passing the torch back and forth while posing for publicity shots during a six-hour spacewalk at the International Space Station. Cosmonaut Sergey Ryazanskiy floated out of the Pirs airlock first, carrying commercial Go-Pro cameras and other gear to record proprietary video of the torch for Olympic organizers in Russia. Fellow spacewalker Oleg Kotov held the safely tethered, unlit torch in the open hatch of the Pirs module while Ryazanskiy took pictures and mounted cameras on station structure to record the scene. 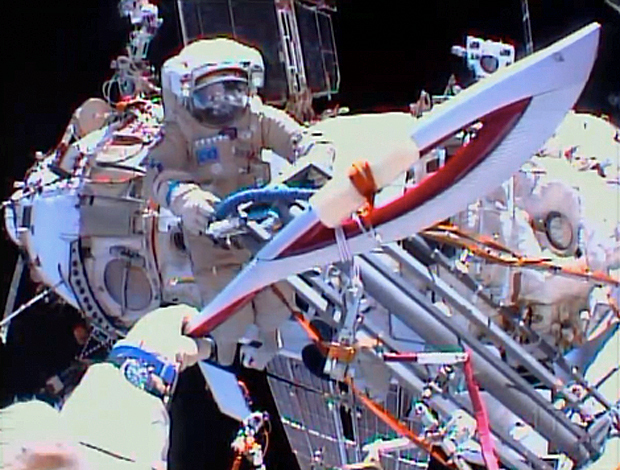 Kotov then floated outside and made his way to the ladder where he met up with his crewmate. "Here we go, wave and smile," Russian flight controllers radioed a few minutes later. Both cosmonauts then posed for the cameras, and Kotov handed the torch off to Ryazanskiy. They then repositioned themselves and carried out another handoff with more posing for still photos and video. While some of the photography was proprietary, views from NASA helmet cameras and others mounted on the exterior of the station provided realtime views. "The weather is beautiful, we'll just take a stroll," one of the cosmonauts said as they moved to a different location. Both men took a break during a night pass, resting and enjoying the view from 250 miles up. "Are you hiding from us?" a flight controller joked at one point. "We are taking a nap," one of the cosmonauts replied. The torch then was carried to yet another location for additional handoffs and more pictures before it eventually was returned to the airlock and safely stowed away inside. "Olympic torch operations are now complete," one of the cosmonauts radioed just under two hours into the spacewalk. If all goes well, the torch will be returned to Earth Sunday aboard the Soyuz TMA-09M spacecraft that will bring Fyodor Yurchikhin, Luca Parmitano and Karen Nyberg back, wrapping up a 166-day stay in space. Nyberg posted a dramatic view of Typhoon Haiyan early Saturday, showing the massive storm, stretching from horizon to horizon, shortly after it passed over the Philippines. The torch relay on Earth is expected to take 123 days, involve some 14,000 people and cover 34,800 miles across Russia, not counting the mileage chalked up aboard the space station. This was the second space flight for an Olympic torch. The shuttle Atlantis carried a torch aloft in 1996 before the Summer Games in Atlanta, but it was not taken outside.